Juan Carlos I (born 5 January 1938) reigned as King of Spain from 1975 to 2014. His name came from his father (Juan de Borbón), his grandfather (Alfonso XIII) and his mother's father's name (Prince Carlo of the Two Sicilies). On 22 November 1975, two days after the death of Francisco Franco, Juan Carlos became king. Franco had picked him and prepared him for the job. In 1969 it had been thirty years since the last king. King Juan Carlos helped change Spain from a dictatorship into a parliamentary democracy. In 2008 he was voted the most popular leader in all Ibero-America. 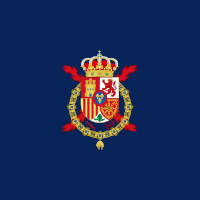 Juan Carlos' wife Queen Sofía of Spain is his third cousin. She is the sister of ex-King Constantine II of Greece. On 2 June 2014, Juan Carlos announced that he would abdicate in favour of his son, Felipe VI. The abdication and handover to Felipe occurred on 19 June 2014. He and his wife kept their titles. ↑ "His Majesty the King Juan Carlos". The Royal Household of His Majesty the King!.